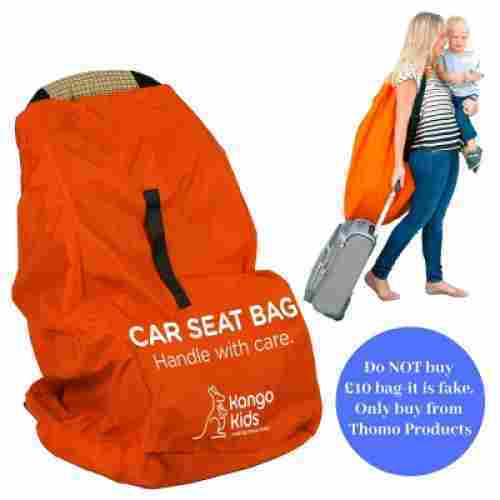 Bringing an infant or child car seat along for a trip on a cruise ship, train, or plane can be quite an uncomfortable undertaking if you do not have a car seat travel bag for it. One of these bags allows you to carry the car seat either by hand or on the back like a backpack. This frees up the arms and hands to tend to other luggage pieces or your children. Manufacturers have made some incredible products for traveling with car seats to make this task much easier for the parents. We feature the best-rated and the most-reviewed of these outstanding items in this wonderful buying guide. Online customers have judged these as the top ones that they would purchase again and are recommending to others. We are proud to spotlight them here for your enhanced shopping experience. Here are the best car seat travel bags in 2019. 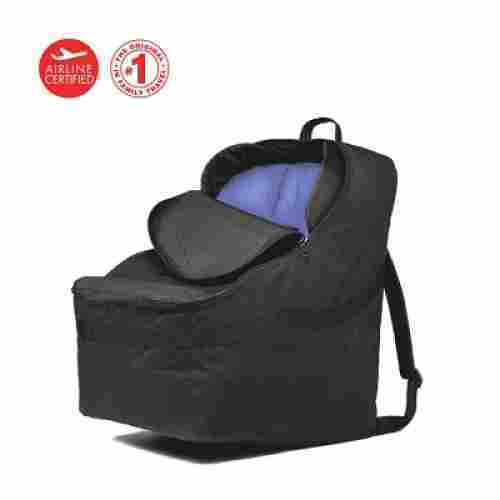 Having over 2,000 online reviews from customers, the JL Childress Ultimate Backpack Car Seat Travel Bag is the most popular product of this category. 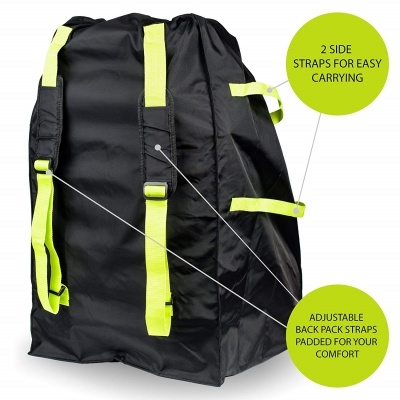 Offered in three different colors, it is airline certified and includes backpack straps for flexibility in carrying that are adjustable and padded. You can adjust the backpack straps that allow the car seat to fit on your back to be either high or low in position for the most comfort. With an above-average price, this great product has the wonderful qualities of being water-resistant, having a lockable zipper closure, and ergonomic harness straps for carrying. Unlike most other travel bags for car seats, this one has the straps attached, so the whole pack sits higher on the back. This results in less strain on the back and shoulders while carrying. Being one of the larger bags for car seats, this item can accommodate other items that you want to travel with for either you or the child. 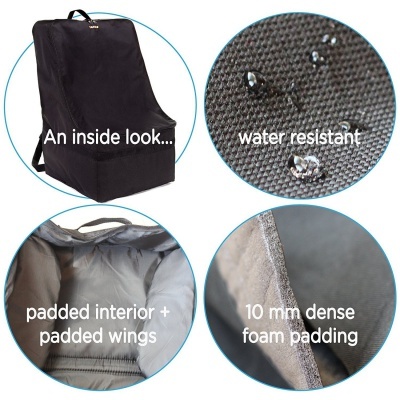 The interior of this incredible bag is well padded for the safety of the seat encased inside. Even the safety features of the seat are protected with added padding of wings specially placed. Available in three various colors, the Zohzo Car Seat Travel Bag is suitable for most popular brands of car seats and gives you the freedom of vehicle safety wherever you travel. The design is waterproof and heavy-duty, and the zipper closure is double and lockable. An added waist strap to this model makes it more comfortable and easier to use, especially when it might contain more than just the car seat for traveling. Highest in the price of all the listed items, this outstanding product will fit most brands of car seats, is waterproof and durable, and includes a waist strap in addition to the shoulder straps to aid in balancing the load on the back. Just the simple addition of a waist strap to this bag adds to the stability of the load and the comfort while carrying it. Sometimes you need the extra support that can come from the waist and hips to help with a heavy weight. Being one of the larger products in this list, this wonderful item has a large capacity to fit extra items you may want to take for your trip such as jackets or toys. Protective feet on the bottom of the bag and interior padding ensure the safety of the car seat while traveling. Even if it gets bumped around plenty, the contents will be safe and secure. The Volkgo Car Seat Travel Bag makes bringing an infant or child car seat easy for travel. It provides hands-free carrying on the back with the easy to use backpack straps that are padded and will accommodate all major brands and models of car seats. Not all items of this type will be suitable for the major brands of car seats, but this one is very accommodating to plenty of makes and models of car seats and strollers. Having one of the lowest prices, this ideal bag is valued for its strong stitching and durable fabric, being water-resistant, and including a free e-Book for kids with a bedtime story. You can feel satisfied and comforted knowing that your baby’s seat will have the best protection from wear, tear, germs, and dirt while you are on the move. This wonderful bag is water-resistant, which is important when you consider where it will be going during your journey. On airplanes, there can be condensation build-up that would get the car seat wet. With this bag for a cover, the large capacity will be protected nicely. For such an item that is going to take plenty of abuse and wear from airport terminals and baggage departments, you want it to be durable and long-lasting. This fantastic bag for a car seat is because of the strong material and stitching. Folding compactly into a pouch that stores easily, this Car Seat Travel Bag is colored brightly for easy identification and fits over most brands of convertible seats, portable seats, and lightweight strollers. It enables you to bring a car seat for travel and guards against germs and dirt from getting on the car seat. Marked Handle with Care and brightly colored, this fabulous cover bag for your car seat will be noticed from far away. You will find it easily even in a crowded airport because of these features. 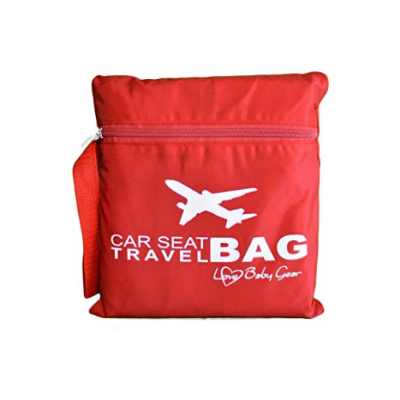 As one of the two lowest-priced items, this amazing car seat bag derives its value from being brightly colored and marked for travel, resistant to mold and water, and made of tough 420D nylon material. The shoulder straps and handles allow you to comfortably carry this as a backpack or as regular luggage when on the move. Because of the tough fabric, this bag is made of it can support the seats of greater weights and volume than lesser models cannot. 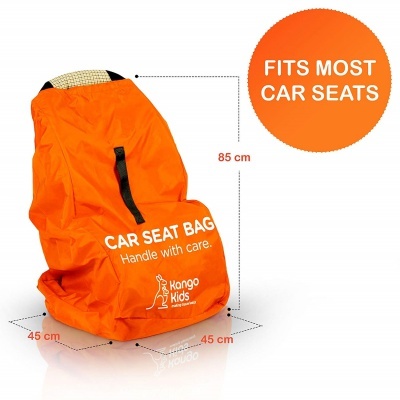 This marvelous car seat bag should outlast most other models because of its tough fabric. It is made of a 420D material which is twice the strength of most other bag models of this type. Made of ballistic nylon material, the Gate Check PRO Car Seat Travel Bag offers superior protection from dirt and germs while traveling. The material is long-lasting and durable and can withstand tear and wear of all sorts. You get a small sturdy pouch of the same material to put this wonderful bag in when it is not in use. This keeps it secure and clean when it is not protecting the car seat during travel. The price for this great item is below the calculated average. 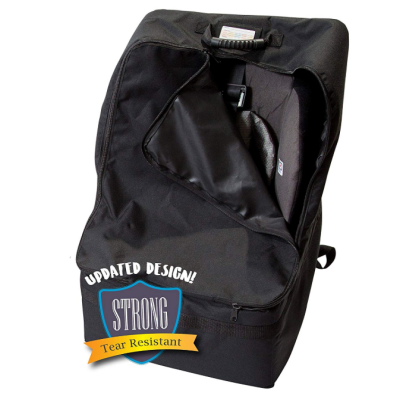 It has the amazing features of plenty of additional room for extra items, including a pouch for storing, and being made of tough ballistic nylon fabric. You can feel comforted in knowing that this wonderful item will protect your baby’s car seat when it is out of your sight with other people handling it. Extra storage space is possible with this large bag. You can put many other items in the bag with the car seat, such as clothing, toys, diapers, or other lightweight things that won’t add to the weight greatly. This sturdy product is long-lasting for many years of use as it is made of tough ballistic nylon to handle the roughest of care with ease. This Car Seat Travel Bag System comes with a carrying pouch with handles that attaches to the interior of the bag when not in use. It will fit most brands and models of car seats and was designed by a mom of three kids and a previous airline employee. Resistant to water and tears, it has a generous size and is made of strong Oxford nylon material. There are three ways to tote this fantastic bag with your car seat in it. It has a front handle, two side handles, or two straps for the shoulders for carrying on the back for simple carrying of this bag. Average in cost, this great bag for car seats is made of durable Oxford nylon fabric, has many carrying straps for toting, and uses a four-step process for closing the bag to avoid it opening during travel and handling. The different ways of handling this product will all be used for any kind of trip. The handles are ideal for holding it when not moving, and the straps are great for when you are walking. This item has extra straps, so you can carry a heavier load than just the car seat itself. Many other small or lightweight items can be added in this bag for traveling purposes. The four-step process of closing this incredible bag will ensure that it does not open when it is being handled by others or during the trip. It has Velcro straps and drawstrings to secure it tightly and firmly. Made of strong ballistic nylon of 1680D, this Car Seat Travel Bag is durable, lightweight, and water-resistant. The stitching is heavy-duty, and the bottom is reinforced. It works well for boosters, baby seats, and infant carriers and can also be used to tote sports or hiking equipment easily. While some other models have a drawstring, Velcro, or zipper closure, this bag has a strap and buckle closure at the top. This may be more time-consuming to fasten and unbuckle, but it will ensure that the bag is indeed closed. The cost for this wonderful item is below the figured average. It is valued for its strong fabric, heavy-duty stitching, and ergonomic design that can accommodate more than one item. 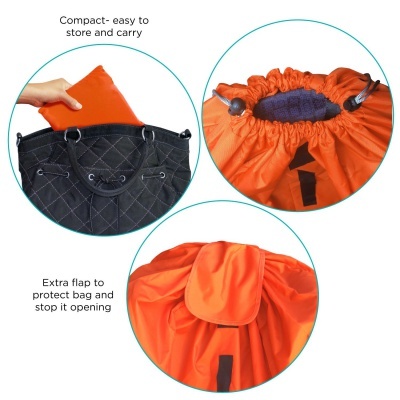 To make it easy and comfortable for you to secure the bag when not in use, the manufacturer has a pouch sewn into the item for an ideal and compact package. You can tote a number of things with this wonderful product including baby seats, boosters, infant carriers, and strollers of light weight. The stitching and fabric that attaches the handles for carrying this bag run the whole length of the product. This adds durability and longevity to the life of this item because it will not tear or come apart as easily without it. The Zohzo Car Seat Travel Bag takes the worry out of vehicle safety for our child when traveling as it fits most brands of car seats. The design is waterproof and heavy-duty, plus comfortable to carry with the handle or the backpack straps. When you are toting this incredible bag, you can change up from carrying it on your back or supporting it by hand. It has these different strong handles and straps to make your transporting simpler. With a below-average price, this ideal product derives its value from the versatility to fit most car seat brands and models, being waterproof, and flexible in carrying with the handle or the backpack straps. Whether you prefer to carry your child’s car seat in your hands or on your back, you can do either with this bag as it has both kinds of straps. Most brands of popular and regular-sized car seats will fit nicely in this product without any problem of being tight or awkward. Resistant to tears and heavy-duty, this fantastic bag for car seats is tough enough for airport terminals and their bustling baggage departments. This bag should make it through without the usual tears and marks that can occur. The Caboodle Car Seat Travel Bag has backpack straps that are adjustable for carrying the car seat hands-free, and they are padded for added comfort. It fits all car seat sizes and models and will last for many years of dependable use because of the tough outer fabric. You can adjust the shoulder straps and the handles on this incredible product to suit your particular body shape and the load of the interior, making it easy to use and comfortable. Average in cost, this wonderful travel bag has the great features of a strong zipper closure, suitable for all types of car seats, and padded adjustable carry straps for toting the seat. The backstraps are one of the most important features of such a bag for a car seat. You have to carry so many other items when going on a trip that you must carry the car seat on your back with this fantastic bag. These are adjustable and well-padded for comfort. This wonderful item is so large that you can fit other items in with the car seat for your travel. You can put lightweight big items such as jackets or sweaters inside the bag for additional space. Sometimes during travel or in the baggage compartment of transportation modes, the closure of a car seat bag can come open. This one will remain closed because of the sturdy zipper closure. Created of ballistic nylon material, which is the very fabric that is used for the military’s lining of bulletproof vests the Love Baby Gear Ballistic Nylon Car Seat Travel Bag is made durable and extra strong. It will not rip or break when used under regular conditions and is the largest bag offered. With a drawstring closure instead of a zipper, you will be able to tie the opening shut much better and secure. These are also very easy to open as well. The cost of this great item is below-average. It is valued for the tough material it is made of, being water-resistant, and being one of the largest bag models currently available. Whether you have a medium stroller or a car seat to cover and bring for the trip, you can carry either one comfortably on your back or in your hands with this wonderful tote bag. With this being a large bag model, you should be able to fit your model of a car seat in it easily. You will probably be able to put a few other items in the bag along with the seat to save on space. You would not think that an important feature for a car seat cover for travel would be resistance to water. However, planes and baggage compartments often have condensation which would normally get the car seat wet. This bag is very much repellent to water. Travel bags for car seats make them so easy to be carried, especially at the airport. You will have your hands full of other pieces of luggage and your children when on the move. Having the car seat on your back in the car seat bag fees your hands and arms to tend to the other things you need. These bags are lightweight, so as not to add any weight to the seat as you carry it. most of them also have handles to carry them by hand too. This comes in handy when you are waiting in line at a terminal or at other times when carrying on the back is not possible. The car seat travel bag makes the car seat very easy to use. Differing in features, construction, design, capabilities, materials used, and size, these terrific bags for car seats are mostly similar in price. Only a couple of them are higher in price than the others because of brand and features. Of course, the ones with more handles, padding, adjustable straps, and closure possibilities will be at the higher end of the price range. Also, those that are larger and can hold other items for the trip will be more in cost. When these bags have the car seat in them, they can be comfortably carried in one of two ways. There are shoulder straps to carry them on the back like a backpack, plus there are durable strong handles to carry them as you would a suitcase. Both modes of transport will be used during the trip since sometimes it is not ideal to carry the seat on the back. This is why two ways of carrying it comfortably are provided for the user. All of these excellent products will fit most regular types, brands, and models of car seats. Some will even be suitable for strollers of the smaller kind to protect them in transit. The larger bags will not only have room for the car seat but also some other items you may be bringing along such as sweaters, jackets, light blankets, or toys. There is no sense in wasting the extra space that you have in the bag while traveling. Some of the toughest nylon is used to construct these wonderful bags. They are built with the intended use to be worn on the back for transport and taken along on plane, train, and other transportation rides as luggage. Because of the rough handling that they may receive during transport, the material must be sturdy enough to protect the car seat inside. Most of these have padding to protect the special comfort features that your particular car seat may have. The bags are made strong to be protective of your possession when you are not there to care for it. Experts say that even though airlines allow children to sit in the parent's lap, it is best if you buy another ticket and take the car seat with you. During severe turbulence, babies can get injured and distressed. If you're going on a longer trip, be sure to pack up a lot of useful baby gear with you. Don't forget the essentials like baby bottles, sippy cups, pacifiers and of course, some toys to keep your little one entertained. Made of durable nylon fabrics, these excellent products are made to last. You should get several years’ worth of use from any of these because of their strong construction and high quality. A point of versatility for all of these are the closures at the top of the bags. Some have zippers, straps, buckles, drawstrings, or Velcro to seal the top once the car seat is placed inside. The type of closure will be something you want to look at closely before buying to make sure you get one with your preferred closure style. A car seat travel bag is used not only to transport the car seat during traveling but to also protect it during the travel process. When your child’s car seat is in the luggage compartment of a plane or other transportation mode, it can be affected by germs, bacteria, and moisture from everything around it. with these great bags over them and protecting them, the car seat will be guarded against all of these inhibitors. q: Some of these come right to the shoulder height of the person and some are higher. What is the advantage or disadvantage of these positions on the back? Most of the bags have the car seat even at the top with the person’s shoulders if carrying it on the back. This could put extra strain on the shoulders and back. A few of the designs have the seat just above the shoulders thus placing the bulk of the weight more in line with the core of the body. q: Are these equally easy for a man or a woman to carry? Yes, depending on the weight of the car seat. If you have trouble with the heavy weight of the car seat in the first place, then carrying it with one of these bags will make it just a bit easier to carry on your body. Both men and women can tote these equally well. q: Are these just used for airplane travel? No, not at all. Anywhere you need to bring your car seat for your child is an ideal place to cover it with one of these bags to protect it. Other places are trains and cruises that are good for bringing the car seat along. q: Do any of these have a color selection or do they just come in one color? Only a few of these bags have a color choice and those are only a few. Most of the bags are black or blue with a couple of them being neon red or orange for quick identification and spotting from a distance. 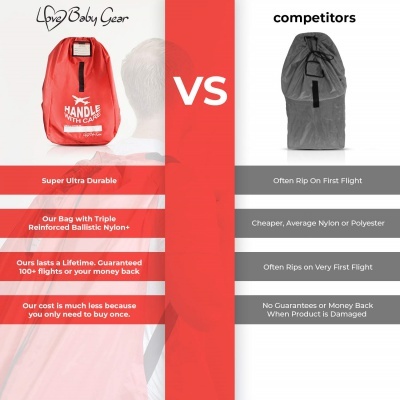 q: What is the most common negative remark from customers online about these travel bags? Tears, marks, and rips in the bags are the most common complaint about these items. With the rough treatment in airport terminals, some wear should be expected. It seems like the ones with the thicker interior padding resulted in fewer tears and damage to the car seat inside. q: Do they all fit any size of car seat? If not, are the brands listed online for the ones you can get for a particular car seat? These will fit most of the popular brands and models of car seats on the market today. A few of the manufacturers have a list of the brands that will fit in their bags but not all of them do.